Situated in the Tabernas Desert, an established location for the movie industry, the film studios of Tabernas have grown into the wild west tourist attraction know as Mini Hollywood. 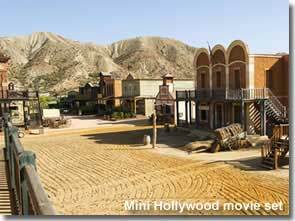 Mini Hollywood has three separate itineraries, Oasys Park, Fort Bravo and Western Leone, all are open for visitors and each offers a different wild west adventure for all the family with western shows among the many other attractions. 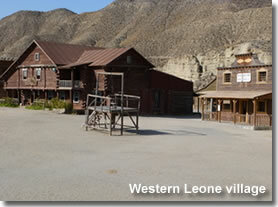 Western Leone and Fort Bravo are still part time working film locations where as Oasys Park, the largest of the three, is now entirely given over to the theme park business. In the 1960s the landscapes of the desert of Tabernas developed into a sought after movie location, well known productions such as King of Kings (1960), Cleopatra (1963), and the winner of seven Oscars, Lawrence of Arabia (1962), all used the desert as a backdrop during filming, attracting big budget Hollywood directors such as Steven Spielberg who chose Almeria for scenes in his blockbuster movie Indian Jones and the Last Crusade (1989) starring Harrison Ford. Sergio Leone, the director of the famous Spaghetti Westerns, starring Clint Eastwood, also capitalised on these unique landscapes, scenes from A Fist Full of Dollars (1964), For a Few Dollars More (1965), The Good The Bad and The Ugly (1966), and A Fistful of Dynamite (1972), were filmed in the western village movie sets as well as the surrounding desert and other well suited spots throughout the remarkable terrains of the province. 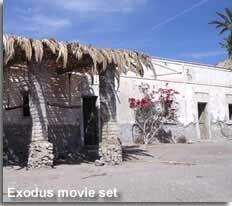 More recently, in 2012, the BBC chose Tabernas to shoot an episode for the next season of the cult series Doctor Who. 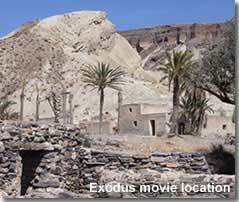 In October of 2013 the landscapes of Almeria were once again in the headlines as filming began for the Ridley Scott movie Exodus - Gods and Kings, the texture and colour of the terrain, and its resemblance to Egypt, being the attraction for the director and his team for some of their movie scenes. This anticipated epic saw the actors Christian Bale (Moses), Aaron Paul (Joshua) and Joel Edgerton (the Egyptian Pharaoh Rhamses) spending time in the province. The film is a loose interpretation of the biblical exodus from Egypt where daring leader Moses rises up against the Egyptian Pharaoh Ramses, setting the Hebrew slaves on a mammoth journey of escape and endurance as they face the ghastly succession of deadly plagues. The actual location used for the filming, El Chorrillo de Pechina, is in the foothills of Sierra Alhamilla on the Tabernas desert outskirts. 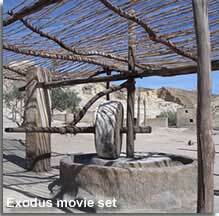 I visited the movie location not long after the filming had finished, walked through the village set and entered some of the houses, it was indeed a surreal experience, with the remote setting and mountainous backdrop it felt more like I could have been there in biblical times myself. El Chorrillo de Pechina - Sierra Alhamilla is found by taking the A-92 at junction 387 and following the sign for Sierra Alhamilla along the ALP-816 towards the Baños de Alhamilla. October 2015 saw further filming in this location, by the American fantasy drama series Game of Thrones. 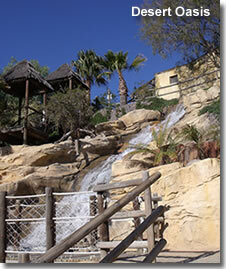 Oasys Park, the original ´Mini-Hollywood´ is extremely popular with children and adults alike and is one of the most frequented destinations for a family excursion in Almeria, its extensive grounds include a western village, pool area and zoo reserve. An oasis in the desert, the park is home to thousands of plants and trees that give shelter to the numerous animals, many of them endangered species, that live there. Not only is the park great fun but it is also very informative, besides offering an insight into Almerias cinema culture it exemplifies the beauty of nature and the need to protect the threatened species of our planet. 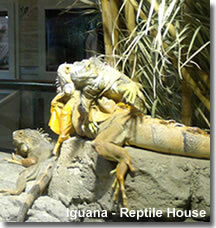 A highly recommended day out, the kids will want to go back time and again. Wild West Shows - The western village main square is the setting for a spectacular simulation of wild west gunfight scenes, the show is held three times a day in the summer months and twice daily during the winter. The duration of the show is quite short, maybe about 20 mins, and it is certainly worth noting the start times and planning your day to make sure you do not miss one of the presentations. Show times are detailed on the free guide that is included with enrty to the park. For me the best part of the Western Show is the impressive displays of horsemanship. At the end of the show both the cowboys and the horses remain in the village square to allow their audience the perfect opportunity to take some keepsake photos. Cancan Shows, held in the Yellow Rose Saloon, are also performed twice or three times per day depending on the season, these start at different times to the wild west shows, usually just before or just after, allowing visitors to enjoy both shows simultaneously if so desired. 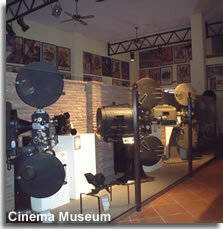 The Museo de Cine, the film museum, which is located next to the bank building, includes many examples of projectors and accessories spanning from the beginning of the last century until present day, and houses an extensive poster display of the movies that have been filmed in the area. The Museo de Carros, the carriage museum, showcases the preserved stagecoaches and waggons that were once used in film production. 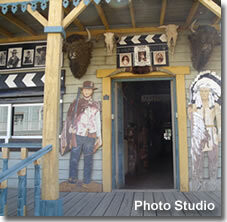 The Disguise Shop and Photo Studio offers a chance for both children and adults to have some fun dressing up in a selection of Wild West disguises and taking home a souvenir photograph of the occasion. 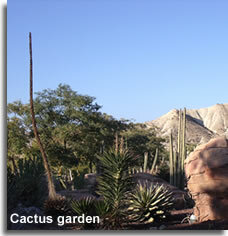 The Cactus Garden is beautifully designed and presented against the desert backdrop, there are more than 250 species which come from different continents. Further recreational areas of the village include the old mine works and the smithy, a BBQ and picnic area, and for the children, a nursery, a games area and a wild west playground. The Arizona Restaurant is open in the afternoons, the food is buffet style, eat as much as you like for a set price, and a discount is available if paying in advance on entrance to the park. In the summer months the restuarant swimming pool is open to diners and outside dining is available. 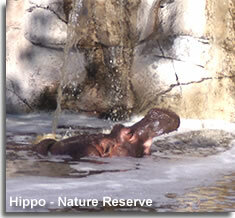 There are alternative options for refreshments and snacks in the Nature Reserve / Safari Park. La Senda de Naturaleza, translated, the Path of Nature, a walking trail through the impressive terrain of the Oasys Safari Park. The pool area, open throughout the summer months of June to September, offers a sensational desert setting and a welcome respite from the heat of the day, there are water slides for the children and a whirlpool for adults, sun loungers are free and refreshments are served from the poolside bar. The Museum of Trails teaches how to follow the footprints of wild animals and recognise a species from the shape and size of a print. This is a fascinating place where there is much to discover about the animals and their habitats as well as enjoying the stunning valley scenery. 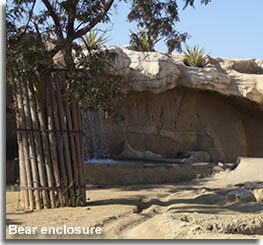 The park is so very well thought out, extremely educational and the animal enclosures are spacious, well designed, decorative and clean. I particularly enjoyed the hippos, tigers and bears but really I could go on, and on, and on... a fabulous day out and worth every penny. The Parrot Show, a real hit with children, is held three times per day, it is presented in the zoo reserve amphitheatre, next to the bat cave. The Mini Train covers some of the ground on the far side of the safari park, the journey starts beside the Giraffe enclosure and ends at the African Snack Bar. The African Snack Bar serves hot and cold snacks, such as hot dogs, burgers, pizza, and sandwiches as well as hot and cold drinks, it is located on the far side of the safari park. La Reserva Coffee Bar and mirador is centrally situated, serveing refreshments indoors or on the elevated outside terrace which has views over the park and desert. 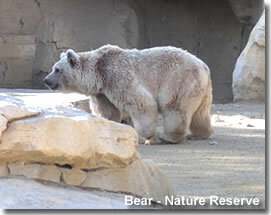 The Ice Cram Snack Bar is available close to the entrance of the reserve. It is worth noting that there are drinking fountains situated at intervals along the nature path and there are plenty of toilet facilities within the park. A map of the theme park is provided on entry. 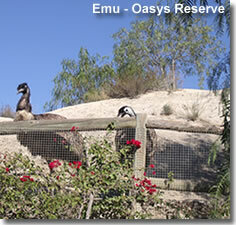 Oasys Park website, currently only available in Spanish. A summer and winter opening times calendar is available on the Oasys website by clicking the link for Horarios then Calendario. OPENING TIMES: SUMMER 10.00 - 18.00 Every day. WINTER 10.00 - 18.00 Saturday and Sunday only. 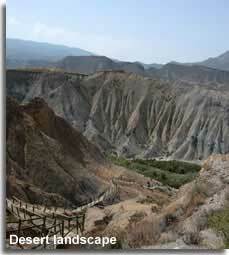 ACCESS: Signposted directly off the N340a Tabernas - Sorbas highway. PRICES: Adults 22.50€, children 12.50€. 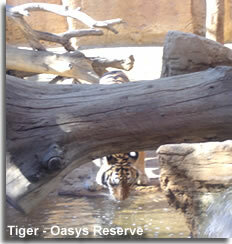 Thank you to David and Elaine Kay Brown from Mojacar who kindly sent photos of their recent visit to Oasys Park.
" 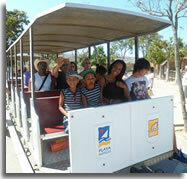 We went to Mini Hollywood with some friends, we all had a really great day out and it was well worth the visit, we would definately recommend this Almeria attraction to others... "
David, Elaine, and friends, are pictured on the Mini train, and crossing the safari park bridge. 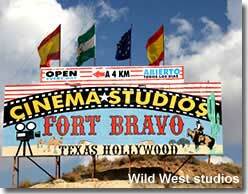 Fort Bravo comprises of two film set villages, a saloon, restaurant, photographic studio, souvenir shop, swimming pool (open June to the end of September) and riding stables. Dazzling wild west shows are played out daily in the summer months and at the weekend in the winter months. The Fort Bravo villages offer a real western ambiance, take a ride on the stage coach through Texas village and enter the many authentically styled buildings such as the saloon and jail house, or walk the streets of the Mexican village with its typical peasant homes, town square and church, hundreds of movies have been filmed in these locations alone. The Cancan shows commence at 12.30pm and 5.30pm, the Western horseback show times are 2.30pm and 7.30pm, established April 2015. Discover the desert landscape on horseback, and imagine yourself as one of the wild west heroes! Riding tours, for either a 15 or 30 minute duration, will take you inside and around the western town of Fort Bravo, the difficulty level is for all ages and no previous experience is required, prices are 8€ and 15€ respectively (price established May 2015). Alternatively, for the more experienced rider, a route through the Tabernas desert can be arranged with a longer time frame. 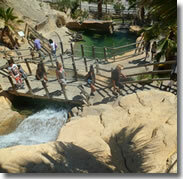 Prices are charged by the hour (25.00€ per person for a group of 2 - 5 people). Perfectly located to make the most of the amazing surroundings, Fort Bravo offers accommodation in the form of rustic wooden cabins. 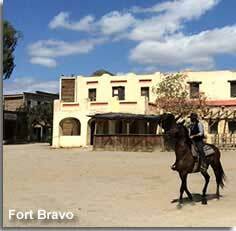 Fort Bravo website, for more information on Fort Bravo, the accommodation and the horse riding excursions. OPENING TIMES: SUMMER 9.00 - 20.00 Every day. WINTER 9.00 - 20.00 *Every day. 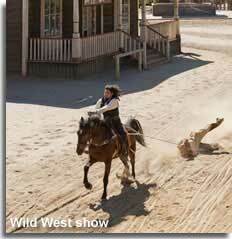 * Wild West Shows - held only on Saturdays and Sundays in Winter. ACCESS: Signposted from the main N340a Tabernas - Sorbas highway. PRICES: Adults 19.40€, teens 15.90€, children 9.90€. 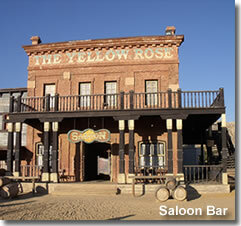 This film set and western village was originally built to film Once Upon a Time in the West (1968) staring Henry Fonda and Charles Bronson, one of a series of spaghetti westerns directed by Sergio Leone and filmed in the Tabernas desert. Those who remember the movie may recognise the desert town of Sweetwater and the McBain Ranch. Glimpses of the desert tee-pees on the outskirts of the village, and the village itself, can be seen from the A-92 highway. Wild west shows are presented daily, both in the main plaza and in the saloon bar. Horse riding is available on trails within the village or out in the desert. There is a restaurant for dining, and the photo studio provides a chance to dress up and take home a memento of the day. ACCESS: Signposted from the roundabout at junction 376 of the A-92 Almeria to Guadix highway, this junction links to and the N-340a Tabernas to Sorbas highway. PRICES: Adults 11.00€, children 6.00€. 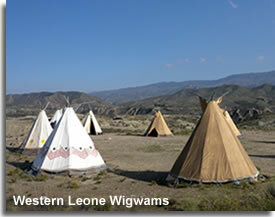 Western Leone website, available in English. Theme parks aside the Tabernas desert has so much more to offer the visitor, the terrain is host to a wealth of flora and fauna and can be explored on foot along the rambla walking trails. The numerous desert movie locations can be visited by guided tours with options including horseback, camel or by 4x4 vehicle excursions.